Sometimes my Sundays get away from me – I rush around trying to finish projects (yesterday it was cleaning out garden pots and trying to find curtains for my bedroom), and by the time I come up for air it’s already dinner time. I glanced in the fridge and saw a package of ground beef that my husband had purchased and a partial jar of 505 Green Chile and that was my inspiration for this dish. It’s quick and it’s a man-pleaser! Heat the olive oil in a skillet over medium high heat and add the ground beef and onions; cook, stirring often, until the meat is completely browned. Add poblano peppers and seasonings and stir to combine. Remove from heat. Pour a small amount of green chile into a large glass baking dish to prevent the burritos from sticking. 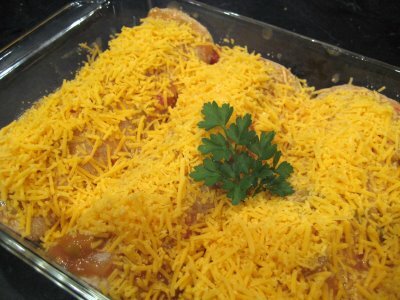 Divide the meat mixture between the four tortillas, sprinkle a little cheese inside each, then wrap tightly and place seam side down in the baking dish. Pour the remaining green chile over the top and cover with the remaining cheese. (see photo above) Cover dish tightly with foil and bake at 350 degrees until bubbly, about 40 minutes. 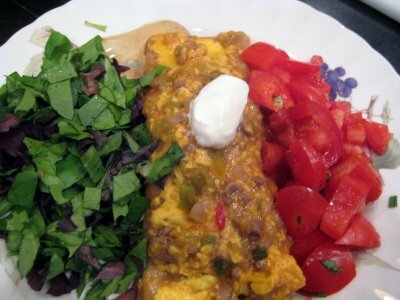 Serve burritos with shredded lettuce and diced tomatoes, and top with sour cream as shown below. If you have some fresh cilantro on hand (I didn’t), mince it up and sprinkle over the top. garden pots should be made from ceramics or hig quality clay for its long lasting nature”-.